National Aviation Academy's students and staff have pulled together to support those in critical need of blood supply by partnering with OneBlood. In September and October alone, 109 donations were given and 327 lives touched by the blood collected at NAA. National Aviation Academy (NAA) frequently partners with OneBlood, a local not-for-profit blood center serving Florida and the Southeast. Recently, a series of tragic events have resulted in an increased need for blood donors; students and staff at NAA have pulled together to support those in critical need. OneBlood has sent several shipments of blood to Puerto Rico following Hurricane Maria and plans to send more in the coming days and weeks, just as it did in the aftermath of Hurricane Irma and Hurricane Harvey. 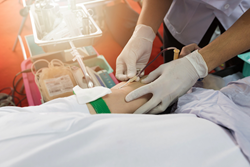 In addition to the natural disasters that have recently occurred, the mass shooting in Las Vegas, Nevada on October 1, 2017 was yet another reminder of why blood supply is so vital. Several drives at NAA have contributed aid to those affected by the events of the past months. Students and staff have donated to benefit families in Texas, Florida, Puerto Rico and Nevada. In September and October alone, 109 donations were given and 327 lives touched by the blood collected at NAA. With campuses in Clearwater, FL and Concord, MA, NAA is always looking for opportunities to contribute to the local community. For more information on how you can help, visit https://www.oneblood.org/donate-now/ or call (800) 659-2080 for details about upcoming blood drives at NAA.